Get creative with your own personalised long sleeve T-shirts. 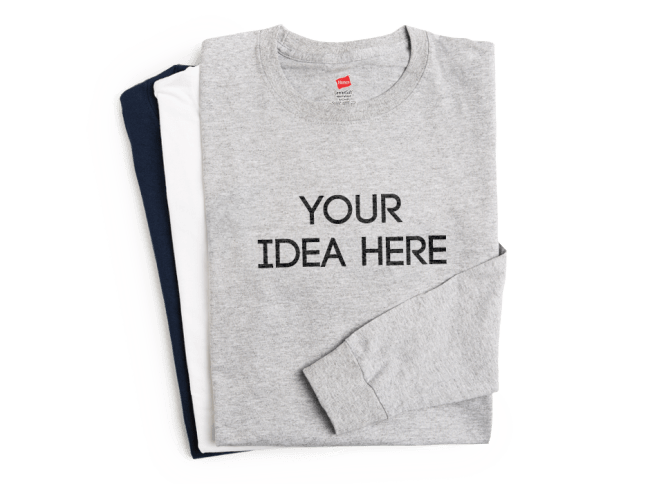 Spreadshirt's collection of custom long sleeve shirts has been carefully selected not only for style, colours and comfort, but also for durability and brilliant printing results. With a huge print area on both front and back, you can add your own logo, artwork, photo, text or designs to create personalised long sleeves. The long sleeve is your canvas. Create a masterpiece! Spreadshirt’s long sleeve T-shirts can be enjoyed wash after wash. They are rigorously tested for durability. With tri-blend fabrics and responsibly-sourced cotton, you can be sure that your custom long sleeve will hold up wear after wear. Stay warm in the colder temps and throw on a personalised long sleeve under your tee. Layering your gear is a great way to stay stylish and comfortable in any weather.